Year Information: Rallying is organised to test car and driver to their limits. High speed ‘stages’ are run on private land (for public safety) over rough and mud-strewn tracks, the winner being the car over all stages combined. In between, there will be a controlled speed drive on public roads to the beginning of the next 'stage' where the process is repeated. 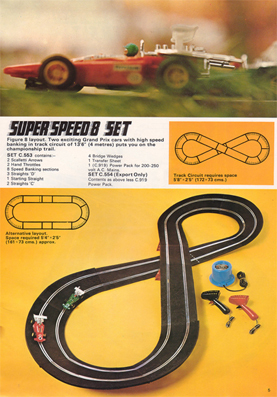 The Scalextric cars depicted are typical of those that take part in rallying which has contributed greatly to the reliability and safety of vehicles of all types.